photo credit: artslife.comAre you staying in the Cinque Terre but wanting to check out posh coastal neighbor Portofino at some point? 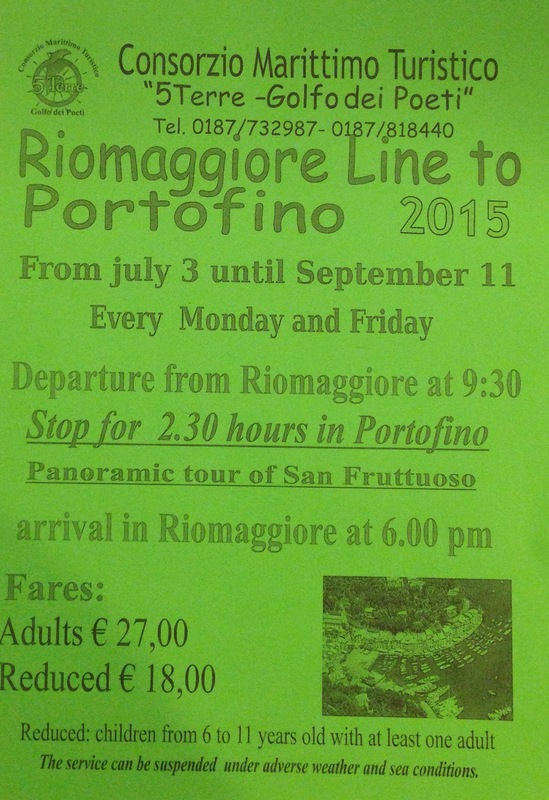 Twice weekly (on Mondays and Fridays) a battello (ferry boat) takes visitors from Riomaggiore (departing at 9:30am) to Portofino and back (arriving back to Riomaggiore at 6pm). The layover in Portofino is for approx. 2 1/2 hours (and since Portofino is pretty tiny, that should be plenty of time to get a feel for the place). These trips will run twice weekly (contingent, of course, on sea and weather conditions) up until September 11th. The costs for this day trip are as follows: Children age 12 and up & adults: €27 Children 6-11: €18 (traveling with at least one adult) Children 0-5: free (traveling with at least one adult) Be sure to bring a hat and sun block (especially if you’re wanting to sit up above on the deck). And if you’re not wanting to break the bank, perhaps something for lunch? Just a word to the wise: Portofino is considered to be a VIP locale (much like the Beverly Hills of Italy) and prices at shops, bars and restaurants can be prohibitively expensive. With that said, it’s a beautiful area and there are some nice walks and hikes nearby. Plus, those that are starstruck can gawk at million dollar yachts and maybe, just maybe, rub elbows with the celebrities themselves.